This savoury golden bread is a specialty of the State of Gujarat in western India. There’s practically as many recipes for dhokla as there are Gujarati housewives — and that’s a lot! 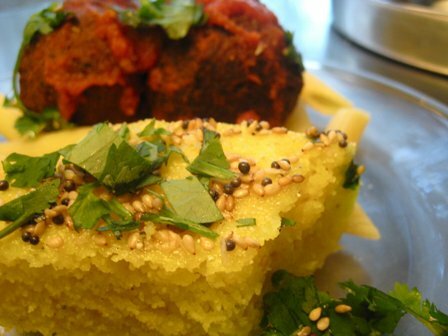 Some recipes for dhokla call for chickpea flour; there’s another version that uses semolina. Here’s a recipe that’s practically instant, using semolina with a little chickpea flour and rice flour added which requires no batter resting time and a short cooking time. Whisk together the semolina, rice flour, chickpea flour, salt and turmeric in a medium-sized mixing bowl. Drop in the minced ginger, chilies, the curry leaves and the coriander leaves. Pour in the oil, the yogurt and half the water, and whisk again. While whisking, add more of the water to bring the mixture to an almost pourable batter consistency. Depending on the variety of semolina and the thickness of the yogurt, you may require more or less water. Place a few inches of water in a deep 5 litre/quart saucepan. Select a shallow 22.5cm (9-inch) cake tin that will comfortably sit inside the saucepan. Set it on top of an upside down bowl or container inside the saucepan, enabling the tin to sit above the water level and below the top of the saucepan, leaving room for a tight-fitting lid. This will ensure that the bread steams trouble-free. Place the saucepan over full heat and bring the water to a boil. Spray or rub a thin film of oil in the tin. Set the tin in the steaming saucepan. When the water is fully boiling, the steaming tin is in place and the tight-fitting lid to the saucepan is on hand, quickly whisk in the Eno powder into the batter. This will aerate the mixture, an essential step in the steaming process. Quickly pour and scrape the batter into the oiled tin, level it briefly with a spatula and immediately put on the lid. Steam the dhokla over full heat for 15–20 minutes or until the dhokla is fully set and does not stick to a knife point when inserted. When the bread is fully cooked, lift it from the saucepan while still in its tin, and set it aside for 10 minutes to cool and firm up. Cut the bread into 3.75cm (1 1⁄2-inch) squares or diamond shapes. For the final seasoning, heat the oil in a small saucepan. When hot, sprinkle in the mustard and sesame seeds. When the mustard seeds pop, crackle and turn greyish, and the sesame seeds are a few shades darker and fragrant, pour and spread the seasoning over the dhokla. Sprinkle with the freshly grated coconut and fresh coriander leaves. Serve warm or at room temperature.